The ATS Acoustic Foam Corner Bass Traps are triangular-shaped bass traps that fit into room corners and/or wall or ceiling junctures to provide outstanding low frequency sound control. 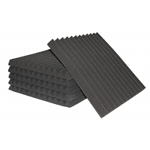 These wedge foam bass traps can be the most cost effective solution for basic sound control and are a reliable acoustic sound absorber. 2 lbs/cf density acoustic foam. 2 pk covers 4 linear feet. ASTM E84 Class A(1) Fire Rated. 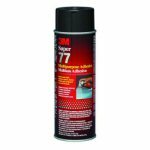 Easy to install with a spray adhesive, such as 3M Super 77, or double-sided tape strips. Follow this link for foam installation instructions (PDF). These babies did the trick!